Heartless that acts with Aquatank. Unpredictable creatures, dashing forward one minute, cowardly retreating the next. They are invigorated by the sparks from Aquatank. 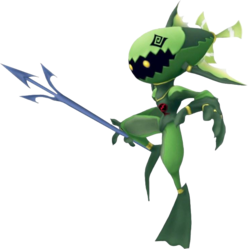 A Heartless that likes to team up with the Aquatank. It attacks with a spear or charges its enemies. Decrease the values of all cards by 1. The Screwdiver is an Emblem Heartless found in Kingdom Hearts and Kingdom Hearts Chain of Memories. They often appear attached to Aquatanks. Colored in shades of soothing sea and dark green, with gold bands and highlights, the Screwdiver has taken on a form suitable for its underwater habitat. Sleek in form, they have finned feet to assist them in gliding through the water. Their elaborate helmets help them with both camouflage and mobility, though its use as the former is debatable. While the helmet is shaped like a fish to help it blend in further, the fish's gaping jagged mouth that serves as the helmet's eye slot, as well as the angular spiral black eyes of the helmet and the sinister glowing yellow eyes of the Heartless itself, give any Screwdiver a fierce and lethal appearance. However, the fins at the back of their helmets that serve as a three-bladed propeller are quite useful, allowing them to charge through the sea with great bursts of speed. Their dark green clawed hands also give away their violent tendencies, but the Screwdivers' favorite weapon is their trident; medium blue and featuring three flared prongs ending in lethal barbs, the Screwdiver prefers to use these whenever possible. The Screwdiver's name references the spinning, charging attacks it frequently performs, as well as it looks as if it is clad in a diving suit, complete with flippers and an underwater fishing spear. The name is also a pun of "screwdriver". This page was last edited on 3 May 2018, at 21:10.